My newborn loves the panda. He can coo and gurgle at it for 30 minutes uninterrupted. He lies on his back and I put the panda next to him (they say newborns prefer to see things from the side?) It must be the black and white contrast and those big eyes. He often reaches and touches it smiling all the while. He loves the music too. Honestly, the panda is his best friend forever! So cute! 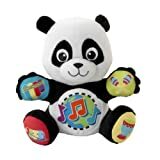 This toy is easy for my son to hold and snuggle and the music wonderful! I saw some other reviewer had challenges in activating the toy – the directions say to press the hands and feet – the stomach is not actually a button, so hopefully this review will help other moms.. My baby loves it and the music is great! Great item and a good value. If your comfortable with dirt, this toys for you! Baby toys that cant easily be cleaned are a terrible idea. My 6 month son loves this thing but after he teethes on it for a little while it is completely soaked, the he drops it on the floor where it gets coated with who knows what (not that my floors are very dirty) it gets very gross. then he wants to put it right back in his mouth. Which I can handle for a day or so, but after that I want to throw it in the washer so hes not eating day old drool/spit-up/floor dirt mud. But the music box is not washable and not easily removed. I have disassembled this thing twice to clean it (not an easy task, requiring wire cutters, a sewing needle, thread, and removing/replacing stuffing and tiny wires) but its becoming much more hassle than its worth. I am just going to throw it away before he becomes too attached. I would hate to have to tell him he cant have his favorite toy. What a shame they didn’t make the music box removable because it really is a good toy. A trusted, award-winning musical banquet for little eyes and ears! Friends gave us the BABY MOZART video (made 1998) as a gift for our infant when he was 4 months old. He loved it then and he loves it now. It completely holds his attention for the 28 minutes or so it runs. Our little guy has watched it dozens of times over the last two months. It takes Mozart’s music and presents it in very child-friendly renditions with simple visuals of toys and puppets. The pacing and length are exactly right. Based on the Mozart program, we soon bought BABY BACH (made 2000) and BABY BEETHOVEN (made 2002) on DVD. Save your money. BABY BACH is a total bust. He lasts about 7 minutes at best. He never liked it. I don’t like it. Stupid still shots of toy instruments just sitting there and gratuitous shots of kids lend nothing. BABY BEETHOVEN is a fair program and our little guy will sometimes sit through about 15 minutes of it but it pales in comparison to BABY MOZART. The Beethoven video includes even more pointless shots of children and lots of [pricey] toys and mobiles which it promotes at the end. The music on BEETHOVEN and BACH is certainly as good as the Mozart video but for our baby and for us, the overall presentations just don’t cut it. BABY MOZART however is a wonderful program and should be in almost every child’s video library. With Mozart, they did catch magic in a bottle. Too bad they weren’t able to repeat it with the later efforts. We have always had classical music playing in our home so when Kate was 6 months old, we purchased Baby Mozart. At first I was a bit disappointed: I expected orchestra arrangements and better production values. But soon I realized, duh, it’s for kids, not adults. The simple musical arrangements and low tech images are right on target for babies. Kate LOVES this video. As soon as the opening credits begin, her hands and feet begin to dance and a big smile appears. We point out the different images ("bear","apple","train"…. "colorful whirling thingie") to make it a family interactive time. The educational component makes us feel a little less guilty over TV having anything to do with the education/entertainment of our precious bundle of joy. It would be easy to get sucked into the "video babysitter" vortex (Kate is totally enthralled for 30, count ’em, 30 minutes) but, like anything else, the video is great when used in moderation. Kate’s now 10 1/2 months and just as excited about watching Baby Mozart. We’ve added Baby Bach to her repertoire too. This video does exactly what a good children’s video should do: it holds the interest of the child who is watching it, not just for five or ten minutes, but for the duration. I started my first child on this video when he was about 9 months. It was a godsend. I love spending time with my boy but let’s face it, there are times when you just have to have 10 minutes or so to yourself so that you can wash the dishes or do laundry; that’s when you pop this video in. It’s 25 minutes of entertainment that holds the attention of even very young children. My wife and I have several of the Baby Einstein videos, but I think Baby Mozart is the one you should start off with when your child is very young (Baby Beethoven is good too) since it is just music, no dialogue. Move up later to Baby Shakespeare (poetry) and Baby Einstein (languages). Baby Van Gogh (colors) is also very good. By age two you’ll be graduating to Veggie Tales (but that’s for another review).